PERFECTION MADE EASY AND FRIENDLY! As it is never too late to learn or to simply improve, the ESF Vallée Verte ski school offers adults to (re)discover the pleasures of skiing! In all weathers and snow conditions, our instructors will share their tips in a friendly environment to turn you into the best skier ever. 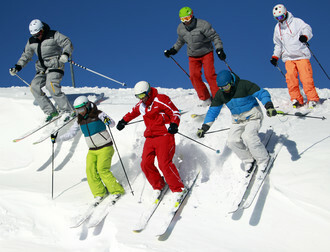 Join our ski group lessons with ESF Vallee Verte Ski instructors.